In both the real world and the filmic world, six years have passed between adventures for Wreck It Ralph‘s titular character (John C. Reilly) and his pint-sized bestie, Vanellope (Sarah Silverman). It hardly matters whether viewers retain any specifics about the duo’s first outing; although Ralph offers a brief recap, audiences need only recall that friendship is the defining aspect of their relationship, so much so that Vanellope had the words “You’re My Hero” emblazoned on a commemorative medal that Ralph wears around his neck. In the years since their 2012 adventure, stagnant repetition has set in. For Ralph, the reliability and consistency of the same daily sequence of events is ideal; for Vanellope, however, the appeal has worn off. In an effort to give his bestie an exciting experience, Ralph crafts a new race track in her arcade game Sugar Rush. Unfortunately Vanellope’s agency conflicts with the desire of the human girl playing the game and in the resulting chaos, the game’s steering wheel is broken. A quick Internet search reveals that the one-of-a-kind item is only available on eBay for a costly sum that the store’s owner Mr. Litwak (Ed O’Neill) is unwilling to pay. With the threat of homelessness looming, Ralph and Vanellope must venture into the unknown realm known as the Internet in order to procure the wheel and restore Sugar Rush before Litwak sells the game for scrap. This new adventure, written by Phil Johnston and Pamela Ribon and co-directed by Johnston and Rich Moore, opens up even more storytelling possibilities than the limited arcade game setting of the first film. Just like many of the Pixar films, adults will no doubt appreciate the (corporate branding) comedy more than kids, but for the most part Ralph Breaks The Internet remains firmly entrenched in family friendly territory. The candy coloured world of the Internet is visually represented by an endless skyscraper city populated by squat, square headed avatars of people (if you squint, they kind of resemble Funko Pops). Companies are embodied by their logos or obvious visual signifiers (a warehouse of auction items for eBay, a large tree full of little blue birds for Twitter, an enormous pin for Pinterest, etc). One of the strangest elements is the intermingling of both real and fictitious companies; aforementioned Pinterest gets a major plug in the film’s climactic set piece while made-up company BuzzzTube, a combination of Instagram and YouTube, dominates the film’s narrative. The largesse of the internet allows the production to greatly expand both its narrative and its satirical targets. After their eBay bid for the Sugar Rush wheel goes disastrously wrong, leaving them with an outstanding bill of nearly $28K, Ralph and Vanellope must find a quick way to drum up some cash. Their attempts to do so drives the remainder of the film, which takes aim at spam ads, personality quizzes, product placement, viruses, memes, gaming and, yes, even trolls. How well some of this content will age is uncertain (were bee puns really a thing…or will they become a thing? ), but for the most part the observations on Internet culture are on point, even if they hue a little simplistic and obvious. 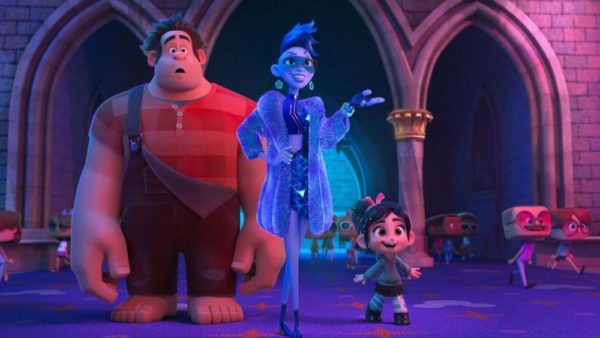 Along the way Ralph and Vanellope encounter a diverse range of vibrant characters, including BuzzzTube analytics maestro Yesss (Taraji P. Henson – clearly having a ball), Dark Web underlord Double Dan (Alfred Molina) and independent search engine Mr. KnowsMore (Alan Tudyk). The most significant character is racer Shank (Gal Gadot), a confident, independent leader of a Grand Theft Auto-inspired racing game called Slaughter Race who prompts Vanellope to reconsider her life goals, thereby widening the rift between the little girl and Ralph. At 112 minutes, Ralph Breaks The Internet is a smidge too long. By the time that the third act conflict has escalated to a crisis of friendship, things feel ready to wrap up. Unfortunately this is when the film’s Checkov title comes into play and Ralph goes into action overdrive, which includes an extended chase sequence and homage to a giant classical Hollywood ape that hits the necessary, albeit familiar character beats that children’s films tend to focus on. 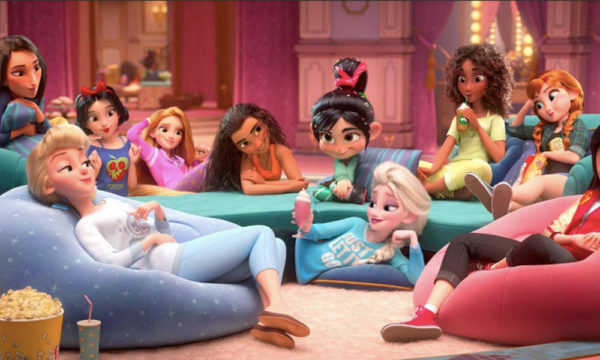 Thankfully the conclusion features the return of the film’s secret weapon: the Disney princesses (Anna and Elsa, Ariel, Aurora, Belle, Cinderella, Jasmine, Moana, Mulan, Pocahontas, Snow White, and Tiana — all voiced by the original performers, save Snow White). The revisionist interpretation of these classic characters may evoke comparisons to later Shrek films, but Johnston and Ribon are savvy in their discrete, smart use of the Mouse House’s invaluable properties. The fact that these characters provide some of the films greatest laughs doesn’t hurt, either. Overall, Ralph Breaks The Internet is solid family entertainment with wide appeal to both kids and parents. The film’s perspective on the Internet is a little simplistic and familiar, but it is also visually dazzling and often quite humourous. As expected Ralph is at its best when it focuses on universal themes of friendship and growing up, both of which are handled in heartfelt and surprisingly mature ways. In a world that frequently feels constructed on doom and gloom narratives, an endearing story about the value and importance of friendship feels both timely and welcome.